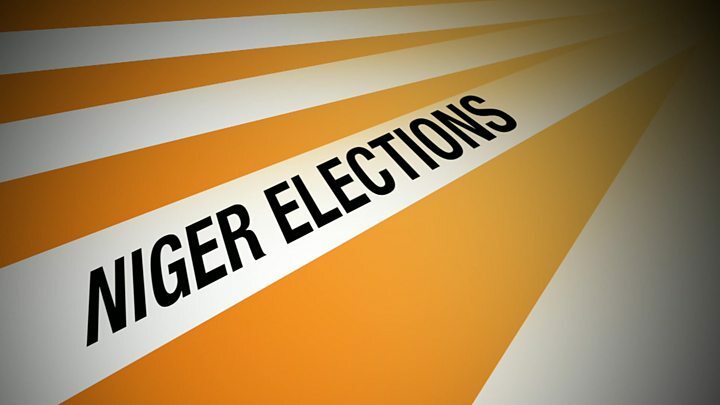 Vote counting is under way in Niger following Sunday's presidential and parliamentary elections. President Mahamadou Issoufou is hoping to secure a second term in the impoverished West African nation. His main rival, Hama Amadou, is currently behind bars accused of trafficking babies, a charge he strongly denies. The run-up to the vote was marred by accusations of repression and a row over identification documents. The authorities announced that roughly 1.5 million people without ID papers would be able to cast their ballots by having witnesses vouch for them, in a move that was condemned by opposition leaders. Niger is rich in natural resources, including uranium and oil, but is one of the poorest countries on Earth, ranking last in the UN Human Development Index. Voting took place under tight security and was delayed in some parts of the capital Niamey, owing to late delivery of ballot papers. There had been fears of jihadist attacks by groups based in neighbouring Nigeria, Mali and Libya. Meanwhile, President Issoufou says his government foiled a coup plot in December. Niger election: Can a prisoner beat the president? One of the candidates in Sunday's presidential election, Ibrahim Hamidou, was arrested for casting doubt upon December's alleged coup but was released in January against the wishes of state prosecutors. Aside from Hama Amadou, a former prime minister, other well-known figures among the crowded field of 15 presidential candidates included Mahamane Ousmane, Niger's first democratically elected president. A run-off will be held if no candidate secures an outright majority. Niger is seen as an important ally of Western powers in the fight against militant Islamists in the fragile Sahara region. However, the country is far from stable. Corruption, food shortages and porous borders remain serious problems.